Efficient Energy Choices Blog: Does Insulation impact star rating? Does Insulation impact star rating? Would you agree that with the BCA 2010 being rolled out, in particular Section 3.12 and Section J, it’s never been a better time to get your head around how to improve the energy efficiency of your designs and projects? In the next few e-newsletters, we will discuss insulation. Houses on timber floors lose a significant amount of heat through their floors. The easiest and most economical way to improve the energy rating is to install minimum R2.0 insulation, as depicted. This insulation will make the floor as good as if it was slab on ground. We recently completed a project on timber floor. When rated with R2.0 for floor insulation, it achieved 5.9 stars. On the other hand without floor insulation, the project did not comply, only achieving 4.5 stars. 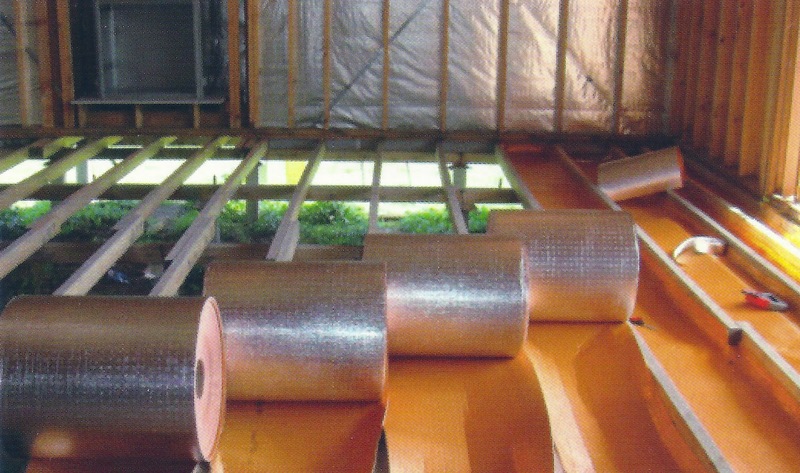 For floor insulation, Air-Cell Permifloor 500 or Foil Board Super 15 or an approved equivalent can be used. For commercial application, with a typical suspended floor without an in-slab heating or cooling system, minimum for most parts of Victoria is R1.0 for non-conditioned space to comply with Part J. For conditioned space, the minimal requirement is R2.0 Part J. For example: the floor of an office in an upper level would need to have insulation of minimum R2.0.